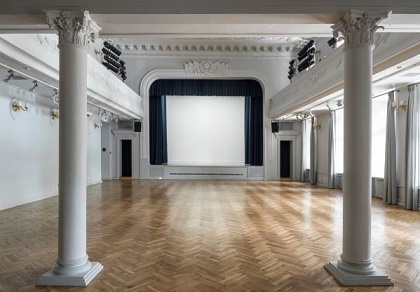 Now rented as a function room, this was the assembly hall of Sun Yat-sen University in Moscow. At the far end is the stage whence Chiang Ching-kuo decried his dad. The following is the original text of a piece that appeared in the travel section of the South China Morning Post’s Post Magazine. Props to the editor there for doing a sterling job with the butchery: though it gets somewhat easier as times goes on, seeing one’s offspring de-limbed continues to be a chastening experience. The ego blow is assuaged by competent editing. 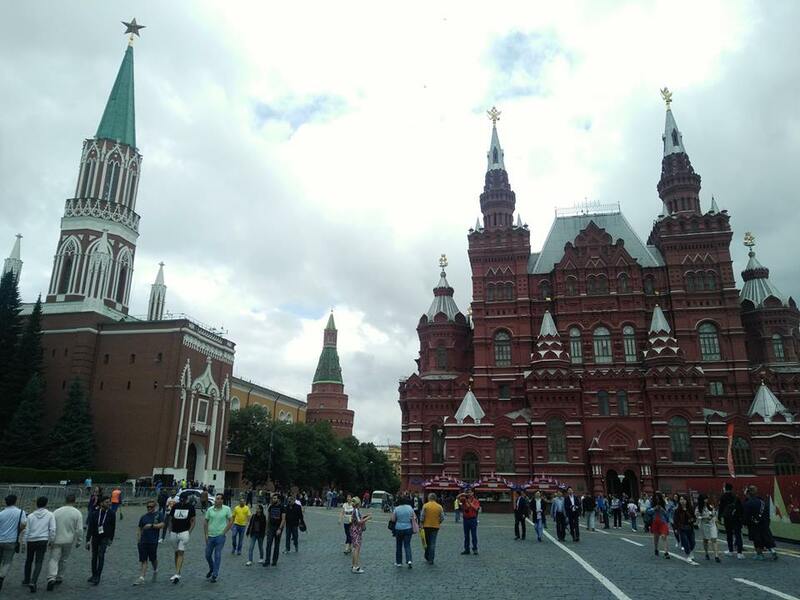 On the morning of the second World Cup semifinal in Moscow on 11 July, there’s barely a football shirt to be seen in Red Square. The red and white chessboard of Croatia pixelates in the throng of early birds eager to catch a glimpse of Lenin’s pickled corpse in a queue that snakes all the way down the hill at Kremlevskiy Proyezd and back up again; the three lions of England are yet to emerge from their – doubtless vodka-splotched – dens. The Chinese, though, are out in force. 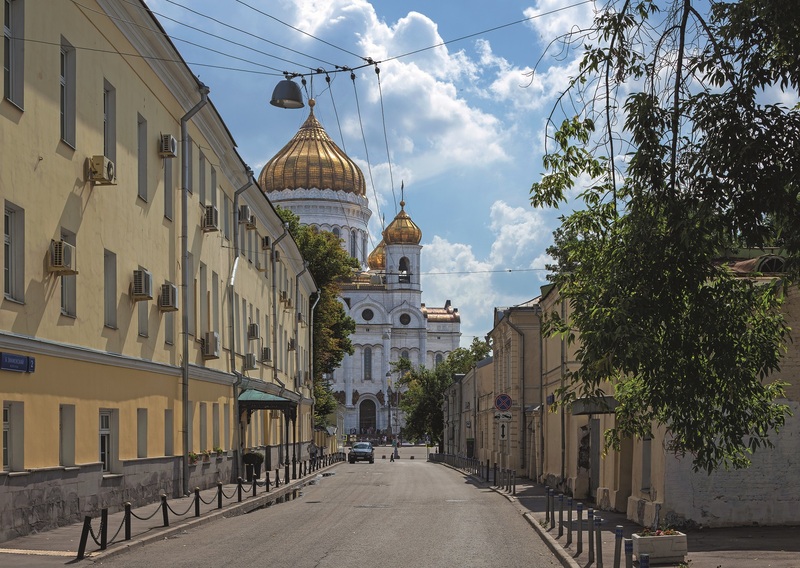 Clustered in front of the waggling red flags of their tour guides all over Alexander Park, shoulder-to-shoulder spanning the breadth of the metro exit, eliciting muttered deprecations from stern-faced Russian commuters; and posing for selfies in front of the gilded onion domes of St Basil’s. Yet apart from a pair of ticket touts plying their mercenary trade in the streets around the Luzhniki Stadium, they seem largely oblivious to the World Cup. Perhaps I’m exaggerating: they’ve been considerate enough to leave a gap there on the left. 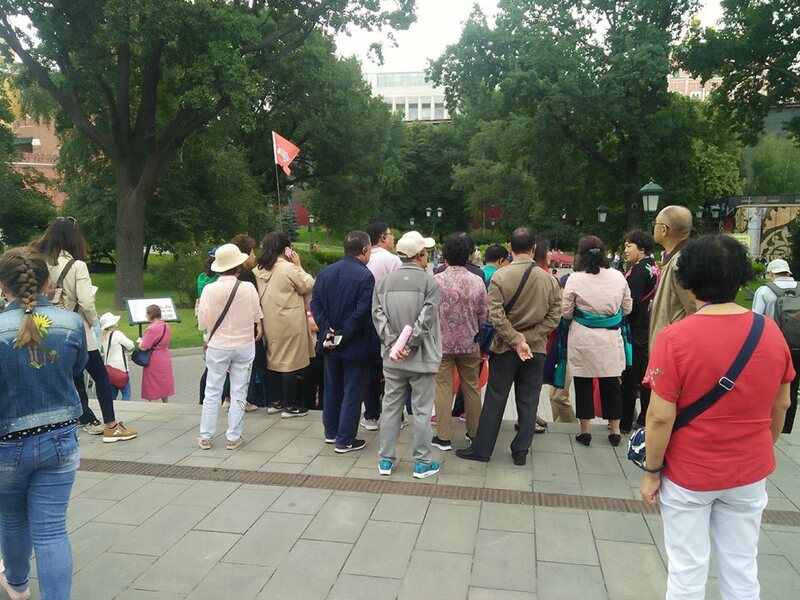 In front of the State Historical Museum, close to to Lenin’s Mausoleum, there is considerable confusion over a FIFA activity zone, where staff are milling around . “What’s going on over there?” asks an elderly man in countryside Mandarin. “I think there’s, like, a soccer game or something tonight,” replies his grandson in flawless Californian. The State Historical Museum in Red Square. Just visible on the right is the edge of the FIFA zone. This wasn’t one of the fan zones which all the host cities had but some some kind of restricted-access affair where they had a stage for performances and a mini pitch. There were actually loads of activity areas around Moscow and the whole event was extremely well organised. 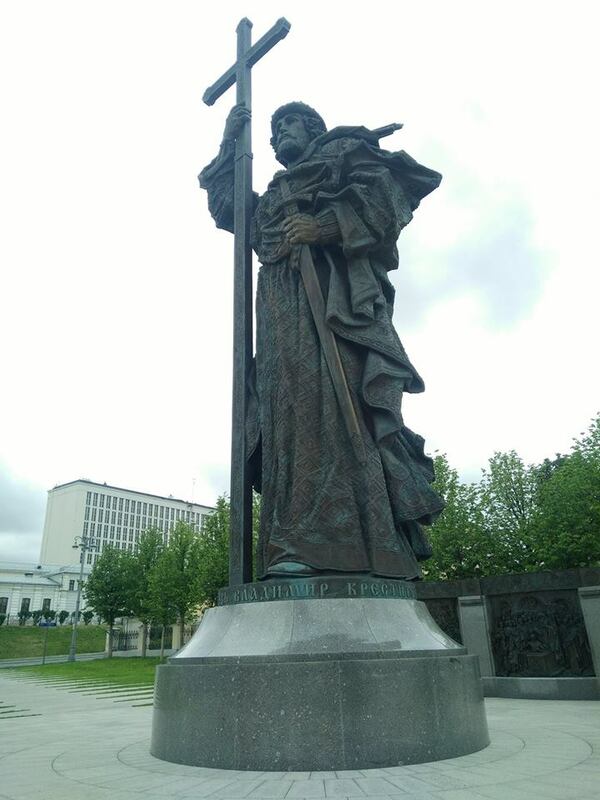 Several minutes north, the tour groups vanish: absent from Borovitskaya Square where the formidable iron likeness of St Vladimir stands guard, and limited to the odd solo traveller in and around the Cathedral of Christ the Savior and the galleries on Volkhonka Street. Few, if any, notice the unassuming building next door to the Pushkin State Museum of Fine Arts. Yet Volkhonka Mansion played a pivotal role in modern Chinese history, hosting not one but two future leaders of Chinese regimes contemporaneously in the late 1920s. The mansion dates from the late 17th century, when a stone construction was erected on land owned by the Naryshkins, a boyar family maternally related to Peter the Great. They lent their name to a style of Baroque architecture of which the mansion was an example. Later the estate became a retreat for Catherine the Great before housing the First Moscow Men’s Gymnasium, a celebrated high school whose alumni included the Russian playwright Alexander Ostrovsky and the Bolshevik Nikolai Bukharin, who would renew his association with building as head of the Comintern from 1926 to 1929. The statue of St Vladimir at Borovitskaya Square. The decision to erect the monument caused a fair deal of controversy with many seeing it as provocative gesture by Russian President Vladimir Putin. His saintly namesake, who is credited with introducing Orthodox Chirstianity to the Russian proto-state of Kievian Rus, was a 10th century prince. As such, he is revered as the founder of Ukraine. The fact that plans for this statue got underway shortly after Russia’s illegal annexation of Crimea was obviously not lost on Ukrainians. There was also discontent in Russia, with people variously branding it a waste of money, a vainglorious metaphor for Putin’s own rule or historical revisionism. As an aside, having frequently referred to the Vladimirs – saint and president – as ‘Vlad’, I was recently corrected by a Ukrainian friend who informed me that the diminutive for Vladimir is ‘Vova’ or ‘Volodia’. The shortened name ‘Vlad’, on the other hand, is for men named ‘Vladislav’. Cheers, Margo! By the late 19th century, the main building had assumed its current form, the four-columned Corinthian portico replaced with a simpler metal canopy perched on poles and corbels. In summer 2018, the gaudy blue hoardings of Conmebol, the governing body of South American football, have rendered this invisible. 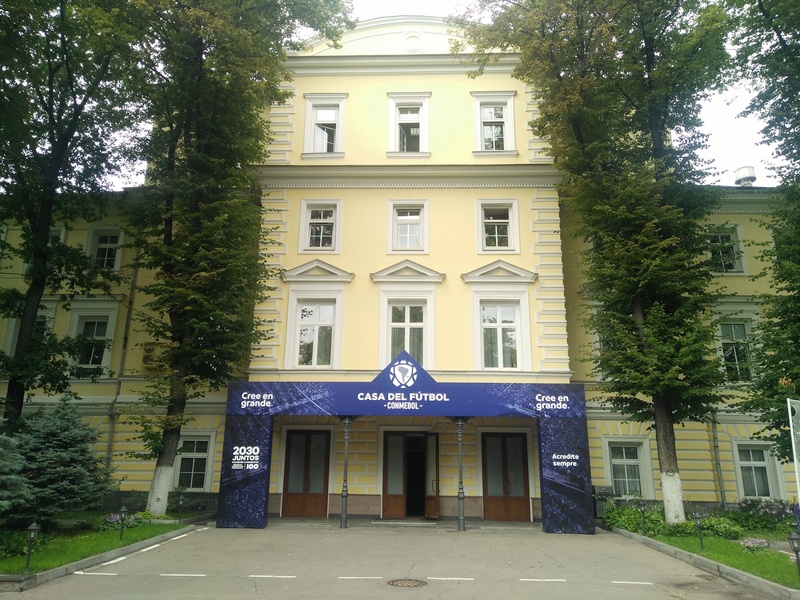 Although the region’s participants have now all made their World Cup exit, the organization has rented the building for the tournament’s duration. An empty five-a-side kickabout court sits in the shade of the lime trees out front. In the lobby, the wide cast iron staircase, which replaced the original wood structures, is flanked by images of various Latin footy legends. The mansion with the Conmebol garb out front. 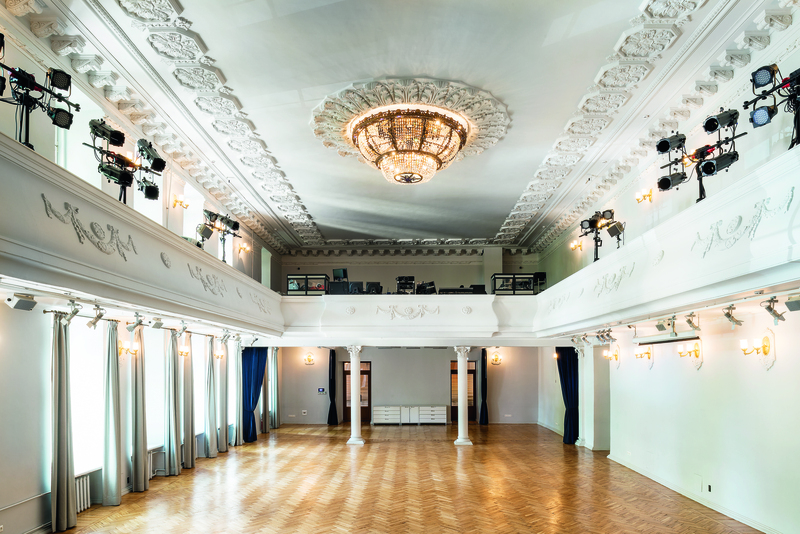 At the far end is a small, nondescript stage, with the Soviet hammer and sickle mould above it, oddly at ease with the more florid decorations. In May 1927, Stalin stood at the podium, attempting to woo an overwhelmingly Trotskyite gathering of young Chinese in what was then the assembly hall of the Comintern-founded Sun Yat-sen Communist University of the Toilers of China (Sunovka). The audience of would-be revolutionaries comprised members of both the Kuomintang (KMT) – which was then nominally the ruling party of China – and the Chinese Communist Party (CCP). Heckling greeted Stalin’s opening overtures, visibly perturbing him, though it soon transpired that these hissed imprecations were directed at the comical ineptitude of the student interpreter, who was quickly replaced with a more competent translator. Though oratorically not a patch on Trotsky with whom he was then locked in a deadly power struggle, Stalin spoke with commendable lucidity, fielding the audience’s – admittedly preselected – questions in a measured fashion, according to Yueh Sheng, a CCP student who went on to become a member of the CCP’s Central Committee quitting the party in 1935 and defecting to the United States. 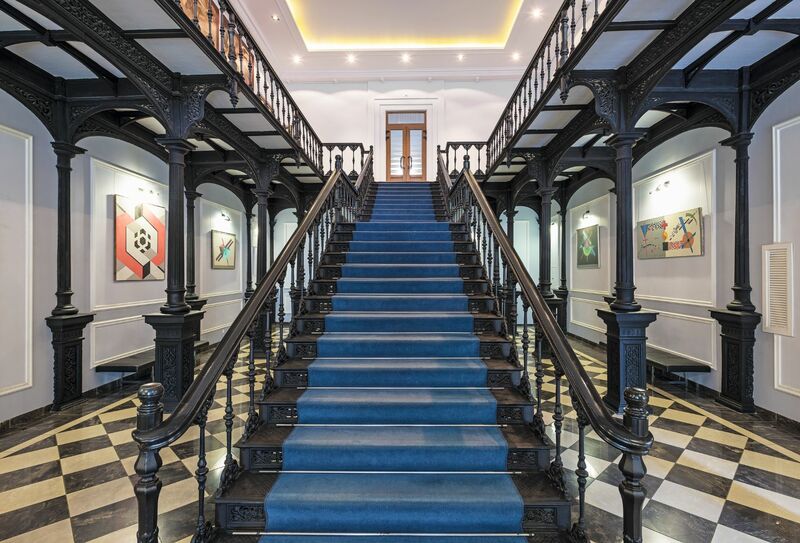 The distinctive staircase with cast-iron banister. In this photo, which was kindly provided by the White City Project, which is currently in charge of the premises, contemporary artworks line the walls in place of the images of South American footballers that were there when I visited. The photographer was Yuri Palmin. But however well-reasoned his arguments, Stalin was preaching to the unconvertible and, when words failed, he took action, dismissing the Trotskyite rector Karl Radek in 1927, and eventually packing him off to the gulag where he was murdered, allegedly by an NKVD agent. The month before Stalin’s stolid display, a stunning declamation against the “traitor and murderer” Chiang Kai-shek was delivered from the very same venue, eliciting “thunderous applause.” The speech came in reaction to news of the Shanghai Massacre of April 12 which signalled the start of a bloody crackdown against the CCP. Thousands of Communists were executed in cities around central and southern China. At Sunovka, as news filtered through, several students took to the stage to decry Chiang’s sanctioning of the atrocity, but the most impassioned denunciation came from his own son Chiang Ching-kuo. The stage whence Stalin addressed the Sunovka students. The administration told me this was the same stage from which CCK issued his denunciation of Old Peanut. I have yet to confirm this. Whether he was pressurized into making these statements is a question that continues to perplex historians, but it seems unlikely. There is evidence that a later letter to his mother in which he further criticized his father, even accusing him of domestic violence, was contrived. A prewritten draft was apparently forced upon him by the CCP representative to the Comintern Wang Ming, in exchange for the possibility of his return to China. Stalin was seemingly keeping Chiang in Russia as a bargaining chip. Yet, in August 1927 when most of the KMT-affiliated students returned to China following the fallout from the events of April 12, Chiang appears to have made no effort to secure a place on the ship back. In January 1928, just as their figurehead was exiled to Turkey, Chiang renounced his involvement with the Sunovka Trotskyite faction. Yet, he would have been well aware that this was no guarantee of absolution. Although he hadn’t got into full swing yet, Stalin had already begun the process that would culminate in the Great Purge of 1936 to 1938 . The Chinese students who tried to take the movement underground were expunged in 1930. No trace of them was ever found. 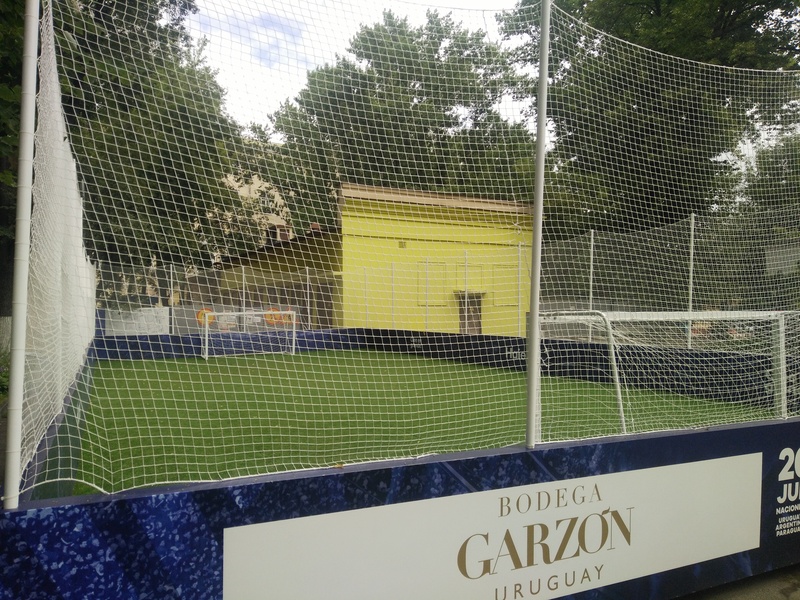 Right next to the entrance of the mansion, there was a mini artificial grass pitch for Conmebol players and fans to kick about on. Another indication of Chiang’s commitment to Communism was his continued close relations with most of the high-profile CCP students in Moscow, one of whom was to play a key role in the KMT’s eventual defeat in the Chinese Civil War. Indeed, indirectly, Deng Xiaoping helped shape the course of his old classmate’s life. His contributions to the eventual Communist victory were vital and without them perhaps Chiang might never have ended up in Taiwan. As a political survivor extraordinaire, Deng, of course, was to eventually ascend to even greater power than his fellow Sunovka alumnus. Back at Chiang and Deng’s old stomping ground in Moscow, the PVC foam panels of the football body mask the original walls of the old assembly hall. The building is now in private hands for the first time in a century and is listed in Russia’s cultural heritage register. Administered by the White City Project, an urban regeneration initiative, which is committed to its “restoration, preservation and revitalisation,” it is home to several local businesses and regularly hosts cultural events and private functions. The Cathedral of Christ the Saviour opposite the mansion. It is hard to imagine the days when the Bolshevik top brass vied for position on stage with a fledgling Chinese political elite that would go on to occupy senior posts on both sides of the Taiwan Strait. Inevitably, much like the England team later that night, many of these figures would fall by the wayside, leaving their roles in this unlikely tale hidden in the halls of the Volkhonka Mansion.